IDC says smartphone sales in New Zealand have shown their first year-on-year decline, 14.5 percent, since it started tracking sales in 2008. It expects the decline to continue in 2018 but says device price hikes will increase overall sales revenues. According to IDC 1,602,000 smartphones were shipped in 2017, down from 1,874,000 shipped in 2016. Chayse Gorton, market analyst for IDC New Zealand, said the decline was the result of a saturated market, a change in vendor strategy, and new features failing to drive faster consumer upgrade cycles. “Many smartphone vendors appear to be increasing their focus on profitability, rather than chasing shipment volumes, through increasing the average selling prices of their devices,” he said. 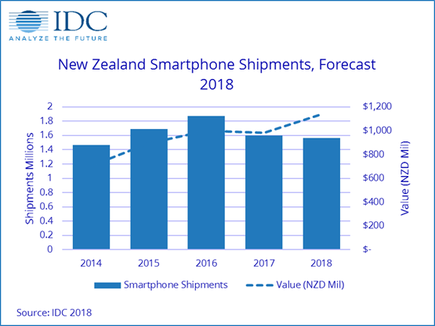 IDC estimates 79 percent of New Zealand consumers owned a smartphone in 2017, leaving a small number of consumers left to make the transition from feature phones to smartphones. It also estimates that the average time a consumer holds on to their smartphone remains around three years, despite new features continuing to be introduced in the latest devices. Gorton said consumers were not seeing the new models as conferring sufficiently significant additional benefits to merit an upgrade.